Immolation - "Shadows In the Light"
Coming two years after "Harnessing Ruin" Immolation prove their staying power with "Shadows In the Light" - a record that sees the band fleshing out the direction taken with their previous full length, yet remaining true to their roots. The material on this disc is far more straightforward, direct and to-the-point in comparison to the band's last two records. The band's trademark discordant harmonies, distinctive grooves and the gloomiest of atmospheres are all accounted for. A noticeable improvement is the drumming of Steve Shalaty, who now seems hellbent on living up to his predecessor Alex Hernandez, as his work behind the kit has become far more technical and punishing. Bill Taylor and Robert Vigna are in fine form, delivering the band's characteric riffs and spine-chilling, wailing leads which again outline a prominent feature on this disc. Frontman Ross Dolan (vocals/bass) also delivers his most convincing work to date, as his grunts remain decipherable at all times, without a lyric sheet at hand. The production harkens back more to the days of "Failures For Gods" and "Close To A World Below" yet with a clarity and heaviness not unlike their critically acclaimed 2002 opus "Unholy Cult". The artwork is up for debate as I'm partial to the Andreas Marschall covers of the band's earlier releases, yet this digital rendered artwork does lend an air of modernity this band needs. 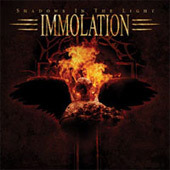 "Shadows In the Light" cements Immolation's status as one of the genre's leading lights and will forward their profile considerably in both Europe and the US.